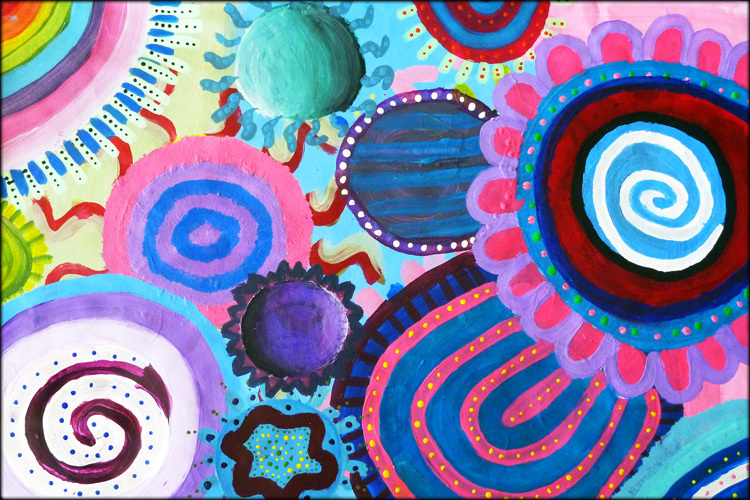 Beginning Art students at Kapaa Middle School worked with Acrylic Paints as they investigated color-mixing, layering, radial design , and a collaborative work environment. Once each student had established a background wash and a few circle designs, they were instructed to move about the room to music. Every time the song changed, they would move to a new location and another painting! Students created colorful circles on one-another’s paintings while also forming a “circle of trust” and a foundation for a supportive and respectful classroom environment. In the end, each student completed the final touches and details on her/his own painting.